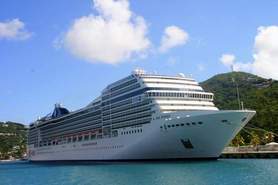 Cruise vacations grow more and more popular every year. Where else can you - 1) unpack your suitcase just once and still arrive in a different exotic destination almost every day? 2) pay one very reasonable price that covers your lodgings, entertainment, travel and meals? 3) find no-cost children's activities? 4) have an amazing view every day? 5) enjoy free movies in a swimming pool, waterslides 13 stories over the ocean, rock climbing walls, putting greens, tennis and basketball courts? Why not join the 15 million people who enjoy cruise vacations every year? Family Travelers Magazine Cruise Spotlight is here to help you plan your next cruise!